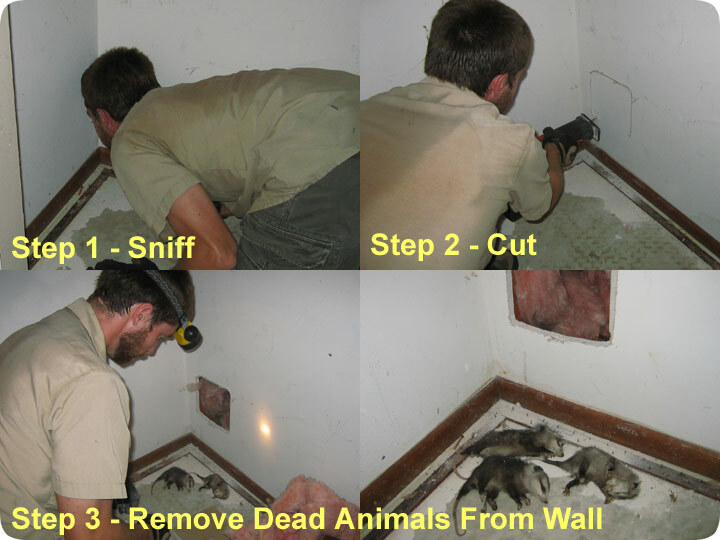 Regardless, on this day, I removed three dead baby opossums from inside a wall. As usual, I entered a home that had a bad odor. I took a cursory stroll around the home in order to gain a sense of the area of strongest odor. I isolated it to a room or two, then jumped in the attic to look. Most commonly, the dead animal is somewhere in the attic. I entered the attic, and saw heavy soilage from opossums, in particular, a lot of opossum droppings. However, I did not find any dead opossums in the attic. At this point I sniff down all of the open walls but I often do not have access to all of them, such as was the case here. Thus, I re-entered the home and started sniffing the walls. This can be a tedious process depending on the level of expertise, but I have been doing it for so long that I can pick up on subtle scent cues that I used to miss as a beginner, and narrow the area down quickly. I sniffed back and forth, and found the area with the relevant odor, at the base of a wall inside a closet. I cut open a hole, and inside I found three juvenile opossums. Opossums leave the mother when quite small, and go exploring. They often stick together, and so most likely, one went down the wall, and two others followed. Once they fell down, they lost access to food and water, and died. I removed all three, and the odor disappeared. The mother must have abandoned the attic, because I never found any further trace of her.